He is the standout name among 11 entries for this weekend's Grade Three Poplar Square Chase, and stable jockey Ruby Walsh views the two-mile contest as a suitable starting point for his season. "Footpad is in great order," Walsh told Racing UK. "We're thinking about stepping him up in trip at some time during the season. Whether he'll run on Saturday or not I don't know at this stage, but it's a two-mile chase for first- and second-season novices, so it's as good a place as any. "He'll have the entry, we'll see how he is on Thursday before deciding if he'll run or not. "We've been happy with him at home, but at this time of year most connections are. "Until you get out on the track, you don't really know." Footpad's potential rivals include Harry Whittington's stable star Saint Calvados, who won his first three starts in Britain last season before finishing a distant fourth behind Footpad at Cheltenham. Alice Whittington, assistant to her husband, said: "We had a look at the Popular Square Chase and when it reopened for entries we said we'd have a closer look as it is a race for second-season novices and that's not a type of race we have a lot of in England. "It could be a good starting point. 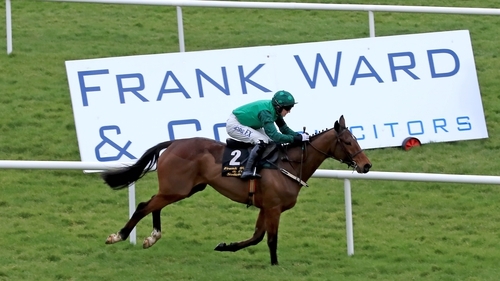 We have also put him in Navan (on Sunday) and we'll see how the races are shaping up." She added: "Rain is the ultimate thing we need with him and thankfully there is rain forecast for later in the week so we'll be making every plan to travel and see what happens. "We all know he is better than what he showed us at Cheltenham last year. He's obviously a horse with loads of class and as a five-year-old he has the world at his feet. He's done really well over the summer and is ready to go again this season." Mullins has a strong hand with Mr Adjudicator, Saldier and Stormy Ireland all in the mix, while Gordon Elliott's Triumph Hurdle hero Farclas and the Gavin Cromwell-trained Espoir D'Allen are other potential contenders. Cromwell said: "Saturday's Fishery Lane Hurdle at Naas looked an obvious starting point. "Espoir D'Allen seems to be in good nick and has summered well and I'd be hopeful of a big run. "It is shaping up to be a very hot race, but we'll know where we stand after Saturday. The trip and the ground would look perfect for him."